Last weekend, we had a pizza party at the barn where my daughter leases her horse. The deal was that we provided the pizza oven, the dough, the sauce and the cheese. The rest of the gang brought the toppings. For us, we made Fig and Prosciutto pizza and Tarte flambée. The fig pizza called for caramelized onions. The last time I made caramelized onions, it took me 3 hours standing at the stove stirring the silly things. I thought that there had to be a better way and there is! It takes longer but there is no standing at the stove. Basically, one fills a crockpot half to 3/4 full of sliced onions, put in a pinch or two of salt, drizzle melted butter and olive oil over the lot, stir, and put it on low for 10 hours. Then, crack the lid and let it go for another 4 to 5 hours. The results is beautifully caramelized onions with no fuss! This made a huge batch and I froze quite a bit of them in ice cube trays. I also had a lot of left over cheese from the pizzas. So between the onions and the cheese, this bread was meant to be! Take 15 g of starter and add 15 g of high extraction wheat flour and 15 g of water. Let sit for 12 hours. In a tub, put in the unbleached flour, the bread flour, the high extraction red fife flour, the buckwheat flour and the Italian herbs. Cover and reserve for the next morning. Use the bran from the red fife as well as some high extraction whole wheat flour to equal 30 g. Add this and 30 g of water to the levain. Let sit overnight. Thaw the caramelized onions if you have some frozen in advance. (Otherwise, slice one large onion and caramelize slowly on the stove with 1 tbsp of olive oil and a bit of butter as well as a pinch of salt.) Cover and reserve. 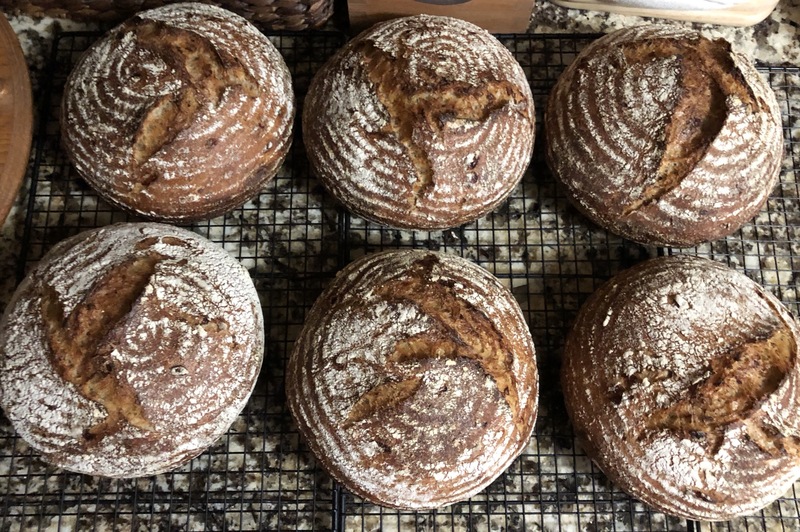 Very early in the morning, feed the levain 60 g each of high extraction whole wheat flour and water. Let rise for about 5 hours in a warm spot. About 2 hours before the levain is ready, add the water, mix well and let sit (autolyse) until the levain is ready. Add the caramelized onions, the shredded cheeses, the yogurt, the levain and the salt to the dough. Mix well and let rest about 30 minutes. Do three sets of French slaps and folds at 30 minutes intervals. The first set has 75 slaps, the second set has 40 slaps and the last set has 10 slaps. 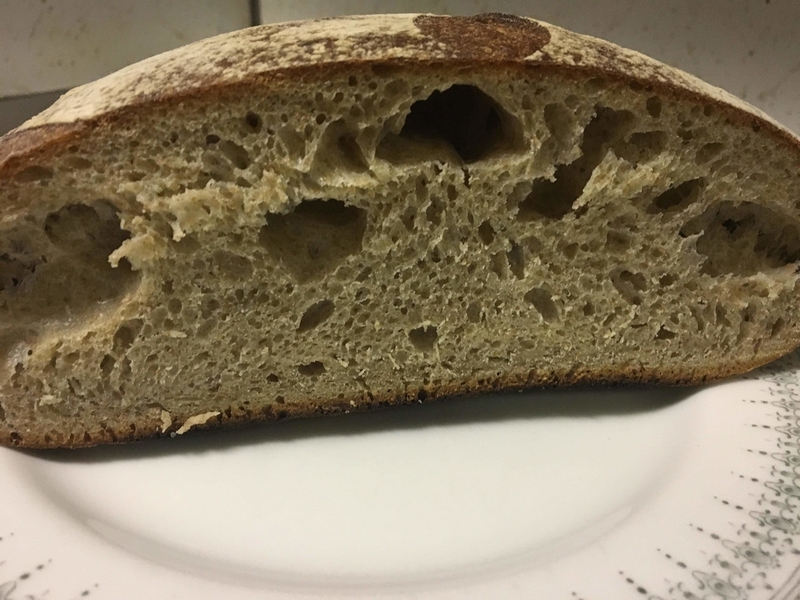 Continuing on 30 minute intervals, do gentle stretches and folds until the dough feels billowy, has bubbles on the surface, bubbles can be seen through the walls of the container and it giggles when shaken. I ended up doing two sets of folds but then the dough had to take a trip to the fridge because the kitchen got taken over by the daughter (She is a very messy baker 🙄). It spent almost 2 hours there. I was happy to see that the dough had risen only about 20% when I got back to it. Tip the dough out on a bare counter, sprinkle the top with flour and divide into portions of ~710 g. Round out the portions into fairly tight rounds with a dough scraper and let rest one hour on the counter. Do a final shape by flouring the rounds and flipping the rounds over on a lightly floured counter. Gently stretch the dough out into a circle. Pull and fold the third of the dough closest to you over the middle. Pull the right side and fold over the middle and do the same to the left. Fold the top end to the center. Finally stretch the two top corners and fold over each other in the middle and continue stitching the rest of the loaf. Roll the bottom of the dough away from you until the seam is underneath the dough. Cup your hands around the dough and pull towards you, doing this on all sides of the dough to round it off. Finally spin the dough to make a nice right boule. Place the dough seam side down in rice floured bannetons, cover, let rest for a few minutes on the counter and then put to bed in a cold (38F) fridge for 10 hours. The next morning, heat the oven to 475F with the Dutch ovens inside for 45 minutes to an hour. Turn out the dough seam side up onto a cornmeal sprinkled counter. Score the dough if you wish (I don’t as I like the rustic torn look). Place rounds of parchment paper in the bottom of the pots, and carefully place the dough seam side up inside. Cover the pots and bake the loaves at 450 F for 30 minutes, remove the lids, drop the temperature to 425F, and bake for another 17 minutes. Internal temperature should be 208F or more. Do you never have an off day? 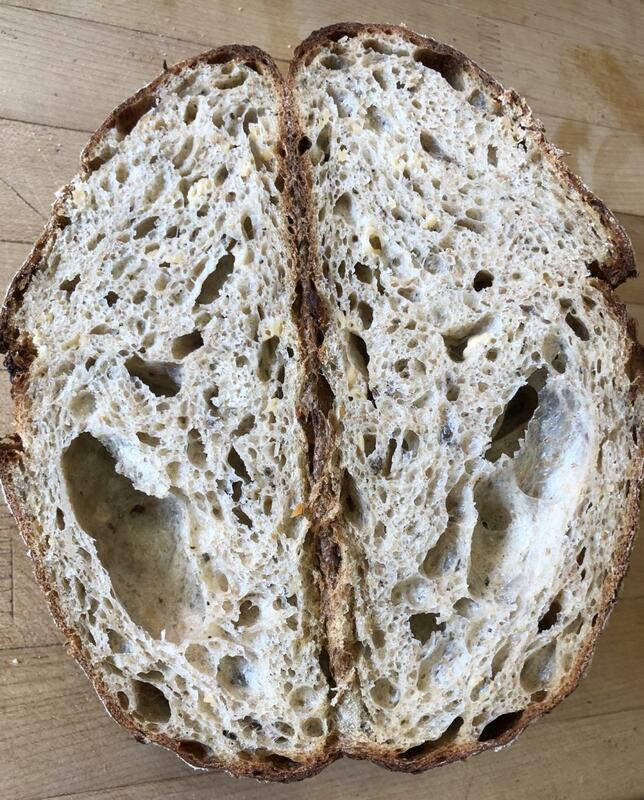 Every one of your posts exhibits beautiful breads. These look exquisite. Must have been the hit of the party (although fig pizza sounds enticing). in my short bread baking career! The worse though was an apricot something loaf that was way too hydrated and I ended up with 12 bricks. In all conscience, I couldn’t sell them and I was even embarrassed to donate the lot to the soup kitchen. Usually, if I blow something, it is a single loaf but that instance was bad! Experience though is helping a lot these days. I go easy on the water and add if needed. I can add but can’t take away! I just took these loaves out of the oven. They weren’t part of the party. I came up with this recipe because of the leftover ingredients from the party. 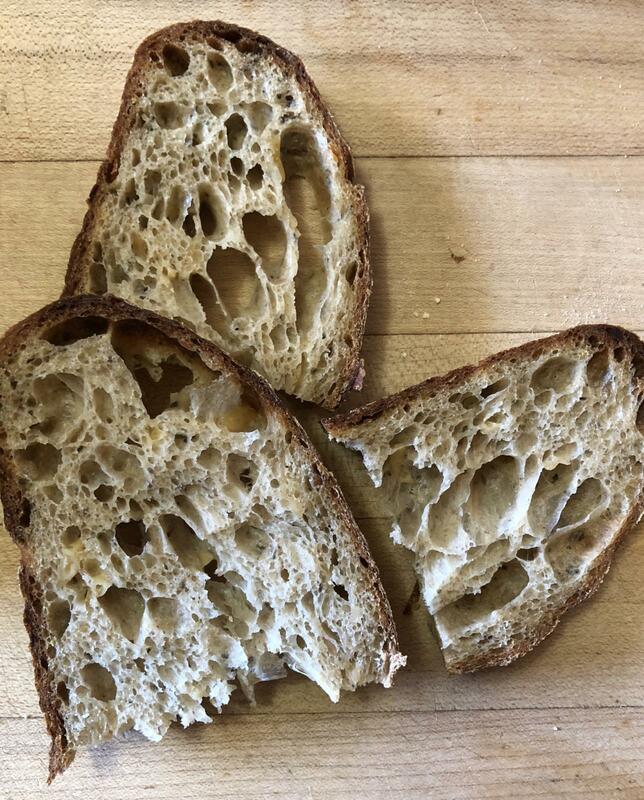 I’ll put up a crumb shot when we cut into one. Suuuper nice. Would you mind if I popped this up on the homepage, swapping out the previous one of yours up there? Can you go wrong with caramelized onions and cheese? You did it again, Danni! Congrats! The formula sounds yummy and the loaves look great! with the slaps and folds and I am much happier with the results. There is just one thing that I can’t quite figure out and that is that I tend to get a hollow part that eventually splits open when I do the slaps. Most videos don’t show this happening although I did see one that did. That particular baker just carried on. I am glad you are going to give it a shot. Let me know how the sage works out in it. I thought I was a bit more careful during shaping but I must have left a big bubble in the middle. Otherwise, I am very pleased with the results. Oh and it is delicious! This one is a keeper for sure! Now this is my kind of bread. Sorry it took me so long to comment, but I've been too tired after work to browse the site. My dogs have had upset stomachs which has lead to me waking up in the middle of the night to clean accidents! Anyway, this looks and sounds awesome. I love cheese and onions in bread. I think I may have to make some type of cheese and onion bread myself :). No proofing before baking? (except for the 45 mins - 1 hour the oven is heating) I am trying this recipe this weekend - the onions smell magnificent - can't wait to see how it all comes out! thanks for a great post! out of the fridge. Not even while the oven is heating! You take your loaves out of the fridge just before placing them in your screaming hot Dutch ovens. red fife or buckwheat flour ( I know what kinda guy am I ) how would you substitute for those ? Amazing baker you are ! You can use any type of Wholewheat flour for the Red Fife. It is wheat after all. And I probably would use Rye instead of buckwheat if I couldn’t get my hands on buckwheat.